Online coaching is the most flexible, cost-effective, way to reach your fitness goals with the technology we have available to us today. If you want to workout where and when it’s convenient for you (instead of relying on someone else’s location and availability), at the fraction of the cost of in-person fitness training, then online coaching is for you. This way, you can get fit even if your schedule is hectic and your budget is tight. What do I get and what’s in it for me? 2. Working on a monthly basis getting a monthly customized workout program created specifically for you and your goals, ideally someone who is either a Beginner or intermediated level. We’ll work with resources you already have available, including your own home, outdoors, or your local Training facilities. You’ll also get Nutritional coaching where you’ll make changes one small – but powerful – habit at a time, based on the precision nutrition format. Add to this the ability to track your workout, nutrition, and body stat progress (this comes as part of the app) as well as personal support and accountability from a qualified coach (that’s me! ), along with the chance of getting your desired progress on your own terms. What’s different about online coaching/training compare to in-person training? Scheduling is a non-issue. You’re not stuck with someone else’s schedule or someone else’s idea of what a training session should look like. We do what works for you. ​We can be much more flexible with your workout programs than a typical 60-minute gym session. I have clients who split their workouts into five 30-minute sessions per week, for example. ​You work out when and where you want, but still get the benefit of a structured program and ongoing support from a coach. ​You don’t need to go to a gym, if you don’t want to! Many of my clients train in their own homes (and you don’t even need expensive equipment). ​​It’s cost effective. You’re not paying a coach a high hourly rate plus membership overhead, so you can get training at a fraction of the price via online. ​Location is not a factor. You can work with a awesome coach who suits your needs from anywhere in the world! Is KyddFitness coaching right for me? For any fitness journey, you will need some level of personal self-motivation and self-discipline. My coaching programs are no different. My job is to provide you with the tools to support, give direction, and give accountability that you need. Your job is to get done what you’ve set out to do, with some guidance from me. I empower my clients to take ownership of their fitness, and enjoy the process at the same time! Check out FAQ section below for more info. Online coaching means having your own personal trainer, without having to schedule time to see him/her face-to-face at a gym location (and at a fraction of the cost!). You’ll get customized workout programs created specifically for you and your goals. You’ll also nutrition coaching where you’ll make changes one small – but powerful – habit at a time. We make use of a select few apps to keep in touch and track your workouts and nutrition, and we schedule regular coaching calls (on the phone or on Skype) to set new goals and tackle any challenges that might come up. Why is online coaching more awesome than in-person coaching? Scheduling is a non-issue. You work out whenever you want (but still get the benefit of a structured program and ongoing support from a coach), instead of being stuck trying to fit into someone else’s schedule. ​Location is not a factor. You can work with a coach who suits your needs from anywhere in the world! I also have clients who live in “inconvenient” locations (e.g. small islands in the Caribbean where I’m from and grown up) where a proper gym facility is none existences. They can get their workouts done without leaving their homes! With online coaching, you’re not tied to a specific gym location. Heck, you don’t even have to go to a gym at all if you don’t want to! ​You get better accountability and support. Rather than booking hour-long sessions at a gym each week, I can provide ongoing (and more effective!) support as you work toward your goals. ​It’s more cost effective. You’re not paying a coach a high hourly rate (plus club overhead), so you can get better training at a fraction of the price. Sweet deal, right? What’s the difference between the 2 programs you offer? MY 2 programs are essentially different levels of coaching support. If you simply need a workout program and some accountability from a coach, then my monthly online training program is ideal perfect for you. For both fitness and nutrition coaching (to make sure your diet is supporting your fitness goals), along with coach support and accountability. If you don’t want any contact with me you can invest into any of the different pre-done training package I have created via the app, basically click and play. My coaching is for anyone who’s currently injury free and wants to increase their strength, energy, confidence, look and feel better than their currently are. It’s for people who recognize the value of having a solid plan to follow, and the importance of accountability. My coaching is for you if you can make health and fitness one of your top three priorities, and you want to build long term health and fitness habits that last the rest of your life, well into your retirement years. My coaching is not for you if you’re not interested in taking personal responsibility. It’s not for you if you’re looking for a “quick fix” health and fitness solution. It’s not for you if you’re not ready to put in the work it’ll take to reach your goals. My coaching is also not for clients who want to compete in physique, bikini, or bodybuilding competitions. I don’t really give clients prescribed meal plans for the simple reason most people don’t follow them as are really strict and are rarely followed for very long. I work with my clients to create lifelong healthy habits that stick, rather than unsustainable short-term “quick fixes”. A diet plan is not empowering; it takes you away from your own decision-making process (which you need for long-term success). What I can do is give you a template to point you in the right direction if you really want one. With support from me, you’ll make your own decisions about which foods are best for you, as well as when and how much of them to eat. We’ll work together to create healthy eating habits, that you can see yourself eating for the foresee able future. 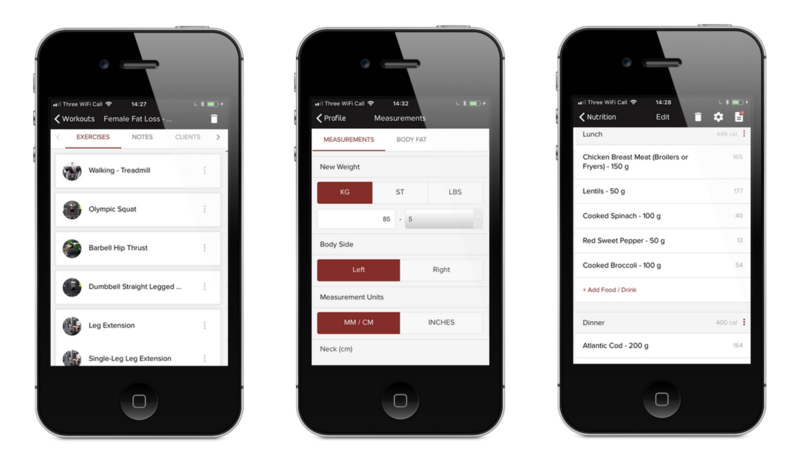 On the other hand I have design a few nutritional templates which you can purchase via the App if you still feel last. I’m a newbie to this working out thing. Will this work for me? Definitely! I work with clients of all ages, backgrounds, and experience levels (some with 1 or 10 +years of experience), there is something for everyone. Not if you don’t want to! But with a select few pieces of equipment at home, you can reach your fitness goals without even leaving your house. I have clients who work out anywhere from their living rooms, to their own garage gyms and backyards, to commercial gyms. If you’re going to be working out primarily at home, you may need to purchase a few pieces of equipment (I’ll help you to choose). A suspension trainer and a set of resistance bands is an excellent place to start, a few selections of dumbbells or kettlebells depending on what you currently have and your individual goal. If you’ll be working out at an established gym, you won’t need any additional equipment. With consistency and time, small actions add up to huge results. If you’re ready to put in the required work, you can achieve a leaner, more sculpted physique in only a few weeks! With that being said Results varies from person to persons depending on their physiological and psychological make up and starting point on their health and fitness journey. If you make health and fitness a lifelong commitment (and I encourage you to do so! ), you’ll make continuous progress, week after week, year after year, you just need to have a positive mental attitude which means “I can try”, “I can do” attitude. There are many ways we track progress in my coaching programs, and we’ll choose something that suits you best. Options include body measurements and photos, as well as tracking your workouts and strength progress within the app I use with my clients. Progress shows itself in some awesome other ways, like your clothes fitting differently, your sleep quality increasing, or better eating habits. How often am I gonna need to work out? This is entirely up to you. We’ll create an individualized training program that fits your life and your goals. I have clients who work out for 30 minutes 3-5 days a week, clients who have more time such as stay at home mum train 5 times per week it all varies to you the individual training needs and goals. I’m here to help you create an effective plan, and hold you accountable to it. I hold office hours on Skype, which can be booked on a monthly basis depending on my diary. If you’re not able to skype via my monthly timing you can sent me a message via the app and I’ll respond during office hours. For more urgent matters, E-mail is also an option for all coaching levels, but I’m only able to check e-mail once a day at most. Am I going to need to give up my favourite foods? Oh hell no. Any long-term nutrition plan that creates lifelong results should involve eating your favourite foods (in moderation, of course!) Example: I enjoy some of my absolute favourite food such dark chocolate as well, I’m human like yourself. You may notice that many – if not most – of the highly successful people you know have coaches or mentors. The most lasting, meaningful, mind-blowing changes in our lives usually occur from having a real relationship with another human being. We humans just aren’t wired to transform our lives by only reading books or articles, or even taking classes. If you enjoy thinking about nutrition and fitness, by all means – read away! And if you can get awesome results with these resources, all the power to you! Online coaching is a bit different from personal training. As a certified personal trainer I also have an in-person practice so I see many clients face-to-face as well. This is a great option for people who need an in-person coach at a gym, but it doesn’t work for everyone. Online coaching is for the type of client who wants an effective and individualized program to follow, with the support and accountability of a coach, but doesn’t need to do it face to face (or can’t, for reasons such as location or schedule). Online coaching is much more about ongoing accountability, goal-setting, nutrition and daily habits coaching, and helping you to improve your life outside the gym than in-person training. How long have you been coaching clients? I’ve been working with clients (in-person and online) for 7+ years now. Not at all. You choose how long you’d like to keep me as your coach. The coaching programs are month-to-month commitments, and can be cancelled at any time without penalty. What’s my next step for working with KyddFitness online program? Please fill out my application form. Then I’ll be in touch to schedule a free phone or Skype consult! Coaching programs start on the 1st or the 15th of each month.